Admit it. You've always wanted to know what the difference is between svarabhakti and epenthesis. Well, that part's is easy, there isn't any, they're two terms for the same thing. Svarabhakti comes from the Sanskrit (as in, Old Hindi) tradition of grammarians and means "loyal vowel". Hm ... epenthesis on the other hand is Greek and means something like "to stick in afterwards". Departing from xenologomania (the excessive love of foreign words), we have the English term helping vowel and the Gaelic term fuaimreag-chuideachaidh. In other words, we're going to talk about those odd extra vowels that you get in Gaelic words like gorm and dearg. First question: Do all Gaelic speakers do this? Yes. Second question: Do they all do the same thing? Silly question, of course not! So ... let us first discover when we put in what. Or, before you clobber me: If, in the stressed syllable of a word, you get two consonants, one of which is, or used to be, voiced, stick in the extra vowel as long as the two consonants are not homo-organic. OK, step by step. 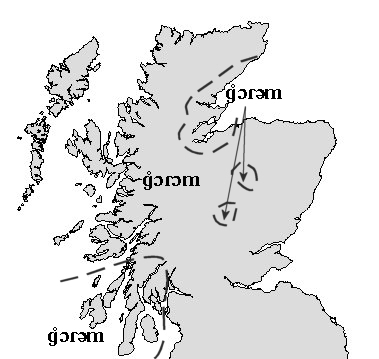 Sometimes we get consonant clusters in Gaelic such as rb, rc, rd, sg, st. As most people learn, even in the first weeks of studying Gaelic, there are some words where you're supposed to stick in an extra vowel to break up consonant clusters, for example gorm [gɔrɔm] or dearg [dʲɛrɛg]. Ask your teacher when or why this happens and you'll get the famous blank face. Incidentally, that's not their fault. Most native speakers, of any language, can't explain why they say stuff. For now, we'll sidestep the why and tell you the when. Mostly this happens when you get l n r and /ʃ/ coming together with b, bh, ch, g, gh, m, mh. The general pattern that's produced is that the vowel immediately preceding this sequence is repeated (for exceptions, see below). So ... I think you get the idea. It's always like this, right? Now what was that I said about exceptions? Well, it's not too tricky. Most dialects don't like the [ɛCɛ] (C stands for any consonant) sequences, so they produce [ɛCa], for example, dearg [dʲɛrag]. The other exceptions are slender consonant clusters where the second vowel is generally [i] and are not a repeat of the first eg tairbh [tɛrʲiv]. The latter does not apply to most Hebridean dialects. So, it's really up to you what you want to do. In general, people seem to find the [i] variant easier to say. And I can tell you're an attentive audience because I can see scores of people scratching their heads, thinking of words like Glaschu /gLasəxu/, calpa /kaLabə/, and mialchu /miəLxu/. Glaschu is easy, it's just one of those strange exceptions that every language produces. Calpa is interesting because it derives from the earlier colbthach [kɔLɔbhəx] that had the voiced stop but /h/ caused the voiced /b/ to devoice to a voiceless /b/. And mialchu /miəLxu/ doesn't have the helping vowel because you don't get the helping vowel after long vowels or diphthongs. Air a tharraing à "http://akerbeltz.org/index.php?title=Svarabhakti_or_The_Helping_Vowel&oldid=1942"
Chaidh an duilleag seo a dheasachadh 9 dhen Lùnastal 2013 aig 21:11 turas mu dheireadh.